BETH ROSENBERG: Hi, this is Beth Rosenberg, and I’m the Director of TechKidsUnlimited.org, and this is your Assistance Technology Update. 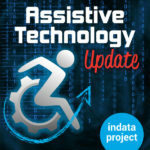 Welcome to episode number 298 of Assistive Technology Update. It’s scheduled to be released on February 10, 2017. Today I have a conversation with Beth Rosenberg who is the founder and executive director of Tech Kids Unlimited and the T3 Digital Agency. Fascinating stuff happen there with the civil marketing and coding. We’ve got a story from the IBM Internet of Things blog about OlIy, a new form of transportation targeting specifically people with disabilities, and more. We hope you check out our website at www.eastersealstech.com, give us a call on our listener line at 317-721-7124, or shoot us a note on Twitter at INDATA Project. Normally this is a part of the show where we feature our segment called an app worth mentioning. Very frequently our friends over at BridgingApps call in and talk about all kinds of apps and do a review and those kinds of things. We didn’t have time to do that today because our interview ran just a little bit long, but I want to encourage you to do something. Head on over to BridgingApps.org, and in the middle of their website click on the button that says assistive technology podcast. When you go there, you’ll find archives of all of the BridgingApps segments for the last four years. They are all there in one place where you can listen to just the BridgingApps segments. Also scroll on down to the front page of their website and click on their stay in touch button and sign up for their newsletter. I’m a regular subscriber, get all kinds of ideas, and you learn about all kinds of apps between segments of assistive technology update app worth mentioning segment. They are good folks at BridgingApps. I encourage you to check out their website, listen to their segments, and sign up for the E newsletter, lots of great information. I’ll pop a link in the show notes. I’m looking at the IBM blog, the Internet of things blog, and there is an article called, “Transforming transportation for the world aging population and people with disabilities.” They talk about a lot of things, but the one that caught my attention was Olli which is the first self driving vehicle targeting specifically people with disabilities. In a partnership between the Consumer Technology Association Foundation and local motors, IBM accessibility research is creating a new device that’s an autonomous vehicle that has some assistive technology built in. The article teases a little bit and ask questions about what would you do with an automatic van or bus that could accommodate somebody with a wheelchair, cane, or other device. A person who is deaf might be able to use sign language to communicate with it, or text instructions or request to the vehicle with their phone. They also suggest that Olli might simplify the way they communicate so that someone with a cognitive disability is able to comprehend more of what’s going on. I’m fascinated with the story. There happens to be a video so I would encourage you to head on over to our show notes and find the link to this Internet of things blog where you can learn more about Olli. I think I’ll be probing more to see if I can learn more about that. Fascinating stuff, check out our show notes. I spend a lot of time keeping an eye out for announcements that come across the press related to disability and technology and assistive technology and education and all those kinds of things. Recently I saw an article that mentioned that an organization in New York called Tech Kids Unlimited was the recipient of a Google Rise award. That’s a program that supports nonprofits that are focused on increasing equity in computer science for students who are underrepresented in some way. I just had to reach out to Beth Rosenberg who is the Director of Tech Kids Unlimited and the person was going to tell us about this. First and foremost, thank you for being on our show today. BETH ROSENBERG: Thanks for having me. WADE WINGLER: Tell me a little bit before we jump into the T3 and Google Rise award and those kinds of things, tell me about you and your background and the history of Tech Kids Unlimited and maybe run down through some of the services you folks provide. BETH ROSENBERG: Tech Kids Unlimited has really been a labor of love for me because, like many special needs parents, I was searching around for something amazing involving technologies for my son to do what he was about 11. He’s 18 now. He has developmental delays on the spectrum, had a lot of early intervention services, went to a special needs school in New York City, is graduating from high school this year, another special needs school. It’s been a long journey try to help him find his place in the world. One thing I know he always loved from the time he was about 11 was technology. I looked and was like, where can I send him that would be a supportive, nurturing place, and there was nothing there. Like many autism or your moms out there, we decide that we’ll create it. So as an educator who was working with technology, I just decided in 2009 that I’m going to create a program where we are going to teach kids to be the producers of technology, because they are already consumers of technology, and instead of playing games we are going to teach them how to make their own games, and instead of looking at websites, we are going to teach them how to make their own websites. That sort of the origin of the program. I like to say that old feminists saying, which is the personal is political. Cut to 2014, we partnered with NYU Tadon School of Engineering and also Seidenberg School of Computer Science at Pace University. We got a fantastic board together and became a non-for profit interest in 2014 and began applying for grants and servicing more children and doing more programs. Here it is, early 2017, we see 250 kids a year throughout the year. We have a seven week summer program. We also have a program during the year that meets on Sundays from 330 to 630 at NYU in downtown Brooklyn. We also go to different community organizations and have lots of partnerships with other organizations around New York City. We are trying to create the techies of tomorrow because these kids are smart. They learn differently, but they are fully capable of entering the field of technology. WADE WINGLER: I’m excited listening because everything here sounds great and it all rings true to me. You put on some of these things, but tell me a little bit about the specific kinds of instructions, the things the kids are learning. And verify for me you’re in New York only, or is it broader than that. And hit for me again the kinds of disabilities we are talking about. BETH ROSENBERG: Basically the disabilities that we are working with is autism spectrum disorder, learning disabilities, and emotional disabilities. I feel a big crossover because I see kids with ATD, attention deficit disorder, OCD, anxiety issues, kids with sensory integration disorder, to have dyslexia, dysgraphia, kid to have poor working memory, trouble with expressive language. They have poor executive processing skills. So there is a lot of learning disabilities that loop into this sort of autism spectrum disorder that we are currently calling it. And also there is a lot of emotional things, tantrum, being very rote, like I only like Thomas the Tank Engine or I only like Powder Puff Girls. That sort of the kind of kid that we work with. We are a New York program, New York City program. We’ve done partnerships in style island. We’ve done some stuff in Queens. But primarily we are in Brooklyn and Manhattan. Those are where our programs are. We’ve done some teacher training that’s going to go on our new website. We are going to have a bigger portal around teacher training because the idea is if we can train other teachers and professionals and therapists to work with our model in our philosophy, maybe they can start at the school clubs and can work around using technology as a tool to teach these kids. For our youth program which is ages 7 to 13, the schedule will go like this. For our Sunday programs, you sign up on a Sunday from 330 to 630, and that three-hour period you can code in Valentine’s day card, learn Photoshop and how to design a logo, make a website portfolio, make a comic strip, code a story, make a movie trailer, code with Python, remix a song, edit a video, create animated gif’s. Those are separate workshops. Create a mobile game. That’s what we do with the little kids in the spring, fall, and winter. In the summer we have a weeklong program, and we have seven weeks of weeklong programs where the students signed up for the week from 10 to 4, and the week is like make your own website so at the end you have your own website, or make a web app and in the end you have a web app. They are all project-based learning activities where the students have a finished project from Friday that they present to their families. We have a presentation on Friday afternoons. But they start on Mondays and the summer at 10 AM. They don’t have to know anything. Of course, if they know something, which is great, it just means you can level them up. We have a very high teacher to student ratio. In a classroom of 20 students for the youth, you will have a master tech teacher, graduate and undergraduate serving as counselors, three students to one teacher, and we also have a social worker. The social worker is really integral to our program because that is the person that can help a student who is frustrated or a student that’s having a tantrum or student that is just having a bad day and their meds aren’t working or they didn’t sleep because they had a stomach ache or whatever it might be. That’s our youth program. I’m really proud of our teen program which we started about six months ago after my own son, Jack, said to me, mom, I don’t want to be the little babies anymore. Of course that made sense because he’s 18. The high school kids should be with high school kids. High school kids should also start building their resume. We dreamed up this program that has really taken off. The Google rise award is definitely our stamp of approval by Google which is incredibly wonderful. We are the first program that they have funded with a constituency is kids with special needs. Most computer science organizations define diversity with race and gender. We define diversity as disability because diversity is disability. In the 21st century, what diversity means is that differences, whether color, religion, physical, expressive, those are all diversity related issues. It’s really incredibly thrilling that Google decided to award us with their Google Rise award in December 2016. Our teen program is called the T3 Digital Agency. T3 means Tech Teen Team. Say that three times fast. We thought, we have these teens, they want to put stuff on their resumes. They are sucking up technologies the more that we teach them. Can we have our own digital agency with real clients? This sort of happened because about six months ago one of our wonderful funders, our seed funder, she was in the back of the room looking in the classroom and was like, Beth, I don’t have such a good website. I was like, it could be better. I was like, wait a second, our teens redo your website? She said, I don’t see why not. Sounds great. We did that for her and we did on the website, the task foundation website which is another one of our founders. This is great. The students love it because the client comes in at the beginning of the class, tells their needs. They put together a document of what they want. They show us of the websites they like. Now our students are going to build in February when we have a four-day program their fourth website, which is really exciting. We do a four-day program the very 21st through the 24th, because in New York we all get off at that time. It’s like winter break. We have other clients. Our digital agency program is really client oriented. We go out through the special-needs world. The special needs not-for-profit world, we all need a lot of help. When I say to them, let’s have teens create that web app, let’s have teens video edit those films that you need edited, let’s have teens do some digital marketing and brochures for your program. The clients are like, yes! What better way to sell our program than by having teens design and create and develop the digital products that we need. Students create these projects, they receive a gift card from the client for their work, like $25. Again, we have a social worker in all classes, 3 to 1 student to teacher ratio. It becomes a community, and environment, a place where teens who are on the spectrum and have huge social, emotional challenges. But all of a sudden they can connect because they are both working on the UX design of an upcoming website, or they are both figuring out what’s the logo and what’s the font that they need to use and how are they going to resize the photos. It’s in a conversation that they have with one another, one conversation leads to the next conversation, it was like a built-in social skills group. WADE WINGLER: That’s fascinating and it sounds like the students are getting all kinds of education and resume building job skills and practical skills and also opportunities for relationship and can negation and things like that. It sounds like the employers—plus this is our getting get cards and it sounds like the people who are coming to you from the business world are getting great digital products. BETH ROSENBERG: Yeah. It’s really exciting to see the teens working hard on something that really matters because they have this client. Very often they are either speaking to the client over the phone in a conference call. They are young adults. It’s not like, oh, I’m tired, I don’t want to do this anymore. Guess what, you’ve got to finish that logo. We need the logo to put on the website. Joe is working on the logo and Sam and Teresa are working on the website part, and you got to collaborate so we can have a finished project on Friday. They get very thrilled to know that their work matters. We all want to matter. We all want to feel that we count in the world. I really feel like the teen program is really helping these teens. Teens are difficult group. They are surly, quiet, cocky. It’s a difficult time in a teen’s life. To be able to learn computer science principles, problem-solving skills, technology skills, all wrapped in one to create a real project, and to be able to point to that and put it on your resume and say I contributed to that, I did that, I think hopefully will help this shift that we need to see in terms of students and individuals with autism spectrum disorder becoming producers, becoming accountable, becoming a real, important part of society. I feel for me, it’s not good enough for my son to bagging groceries at the store anymore. If that’s all he were capable of doing, then great, but he has so much more capability. I’m trying to push Tech Kids Unlimited into the space where parents and teachers and therapists can say, I want more, I deserve more. If I just get the skills, then I can be pushed out into the world. It’s a very scary place to be a parent of a child on the spectrum because the statistics for employment are really dismal. That’s really what I’m trying to do with the teen program, is almost to create a sacred space before you have to do an internship, before you go out and find your first job. It’s like a precursor to all of that. You learn how to interact with the client and how to talk to a pier, how to collaborate with one another, how to share a meal around the table. So many of these tech companies you don’t even get to go out to lunch. You have to sit there and talk to your neighbor and have lunch together. We are trying to change the world. What can I say? WADE WINGLER: I got a million questions but sadly we are getting close to time on the interview. One thing before I ask you for contact information and those kinds of things, as you look into your crystal ball at the future of Tech Kids Limited and T3 Digital Agency, what kinds of things do you see? BETH ROSENBERG: You know when you are successful? When the program is not needed anymore. I would love to see Tech Kids Limited in the next 10 to 15 years fade in the background while jobs for people with disabilities like autism spectrum disorder just bubble over. I would love to see the teen portion, our digital agency—maybe we would just be a digital agency that employs people on the spectrum and produces digital products. I really feel like the world needs to change. It needs to accept that people are different. I don’t know if we are in the right political climate right now, so it may have to be a little bit longer. We’ve made great progress in the past 10 years, but we need to make a lot more progress in terms of figuring out what to do with individuals diagnosed with autism spectrum disorder. We now know how to school these kids. We know meds around these kids. We know that they need physical activity and sensory gyms and stuff. But we have not figured out the employment and residential peace, and those other pieces that really need to be homed in on. We are going to continue to try to do great work, expand our programs, and work with more students and more clients so that we can continue to teach technology to kids who learn differently. WADE WINGLER: Lots of work to do. I know the people are going to want to reach out to you and learn more. What kind of contact information would you like us to have? BETH ROSENBERG: Our website is TechKidsUnlimited.org. My email is on the program, beth@techkidsunlimited.org. I can do this incredible work without the amazing staff that I have which are made up of a lot of NYU graduate and undergraduate students, whether they graduated or work for us part-time. A lot of people work on this program, and they are all young and brilliant and are interested in working with students who learn differently. It’s been a beautiful labor of love, but now it’s really becoming a reality that we have to really start thinking how are we going to take this 1 in 68 children affected on the spectrum and move them into society, move them into the world, make them feel okay about themselves, and provide them with meaningful and successful experiences. WADE WINGLER: Beth Rosenberg is the Director of Tech Kids Unlimited and the newly awarded by Google rise award T3 Digital agency. Thank you so much for being with us. BETH ROSENBERG: Thank you. It was a delight. I hope everyone has a great day. Please go to our website, TechKidsUnlimited.org. All sorts of fun information. We also have Facebook and Twitter. Sign up. We tweet and post often on issues around disabilities education. WADE WINGLER: Do you have a question about assistive technology? Do you have a suggestion for someone we should interview on Assistive Technology Update? Call our listener line at 317-721-7124, shoot us a note on Twitter @INDATAProject, or check us out on Facebook. Looking for a transcript or show notes from today’s show? Head on over to www.EasterSealstech.com. Assistive Technology Update is a proud member of the Accessibility Channel. Find more shows like this plus much more over at AccessibilityChannel.com. That was your Assistance Technology Update. I’m Wade Wingler with the INDATA Project at Easter Seals Crossroads in Indiana.